If you were ever looking for inspiration, or just wondering what might be possible on an average suburban block, Jetto’s Patch in Maida Vale has much to make you think. Dario in the front yard, which they converted from lawn only 18 months ago! 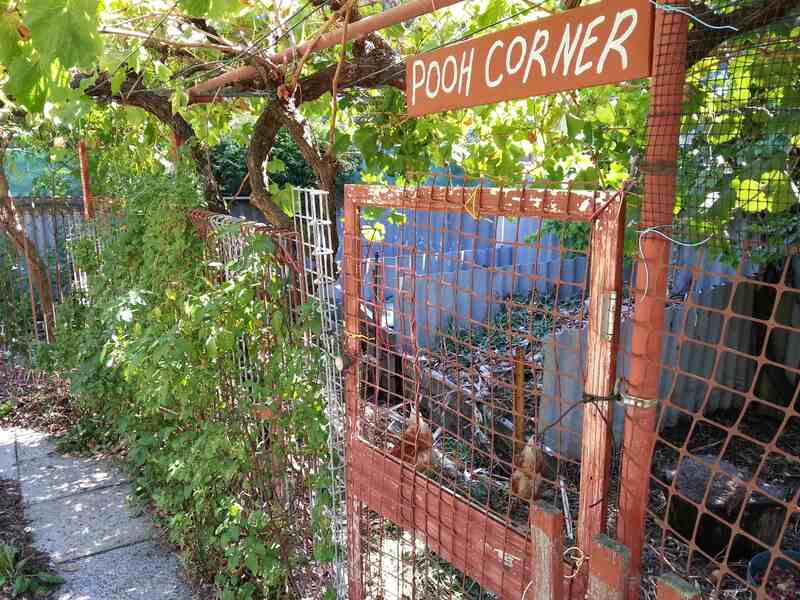 Starting in 1989, but with the newest parts only 18 months old, Dario and Michelle grow something in the region of 500 edible species on their 1482 sq m block. 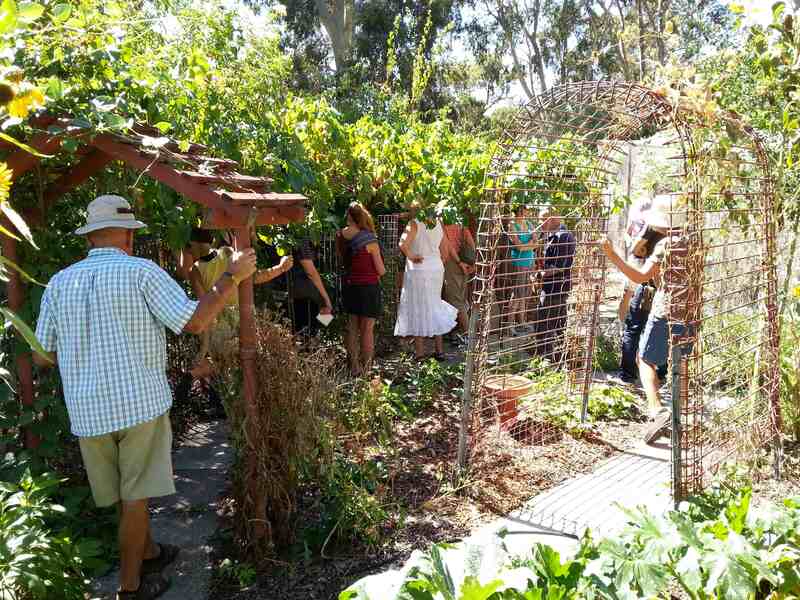 The Kitchen Gardeners were delighted to accept an invitation from Dario and Michelle to hold their March workshop at Jetto’s Patch. 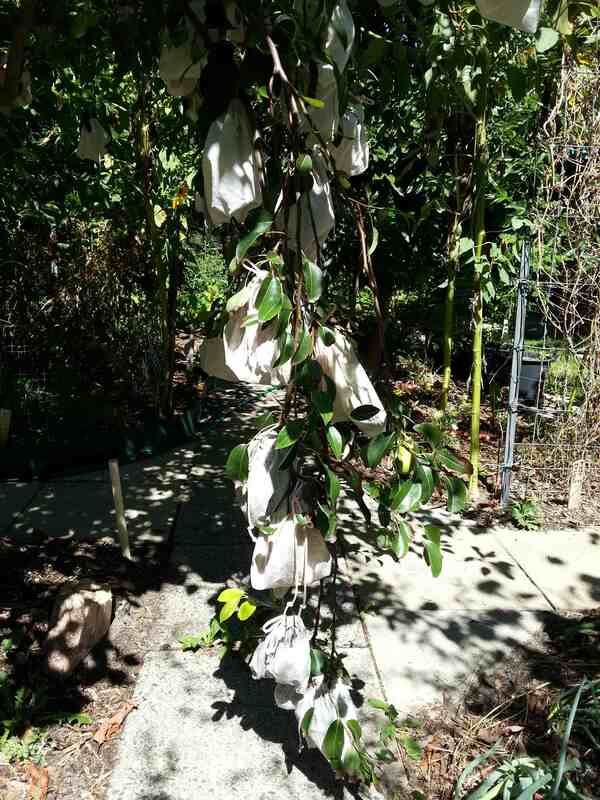 Some of us opted for the advertised potting seeds workshop, where we used some of our collected and donated pots, and made some out of newspaper following Debra’s expert instructions. 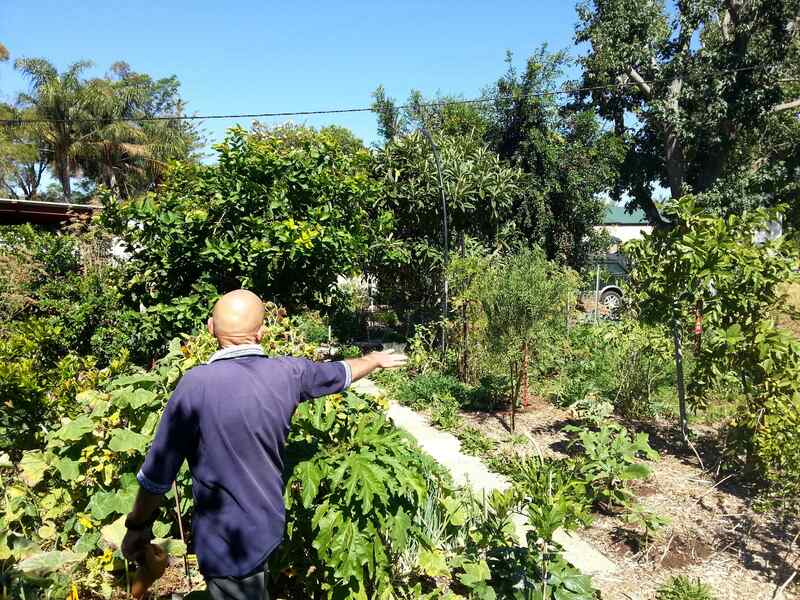 Most of us wandered about the verdant paradise admiring just how many plants and the amazing variety of edible plants it is possible to grow in Perth. There are the obvious ones like figs and grapes along with some very interesting ones that you would not expect to find thriving in Perth: arabica coffee, pineapples, cherries, raspberries. 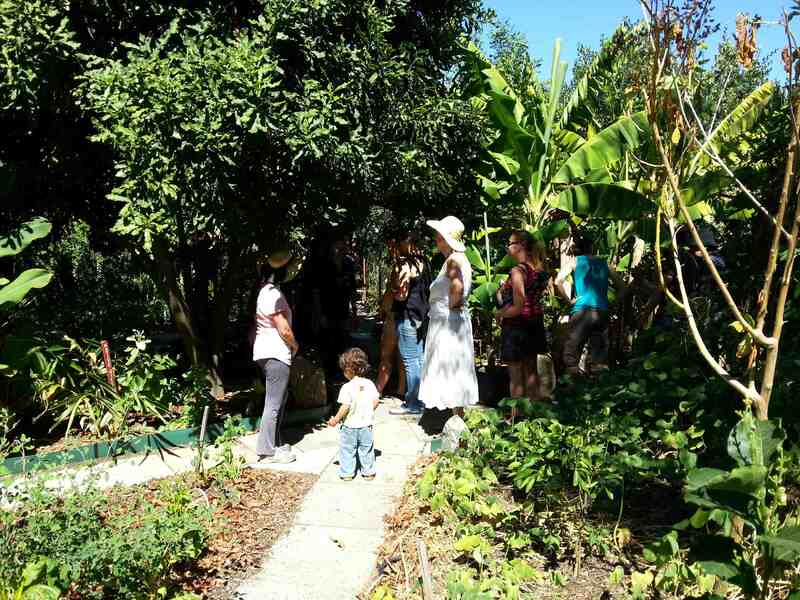 Lots of us took home a little piece of Jetto’s – sugarcane, perpetual pumpkin seeds and a renewed zeal for growing our own food. 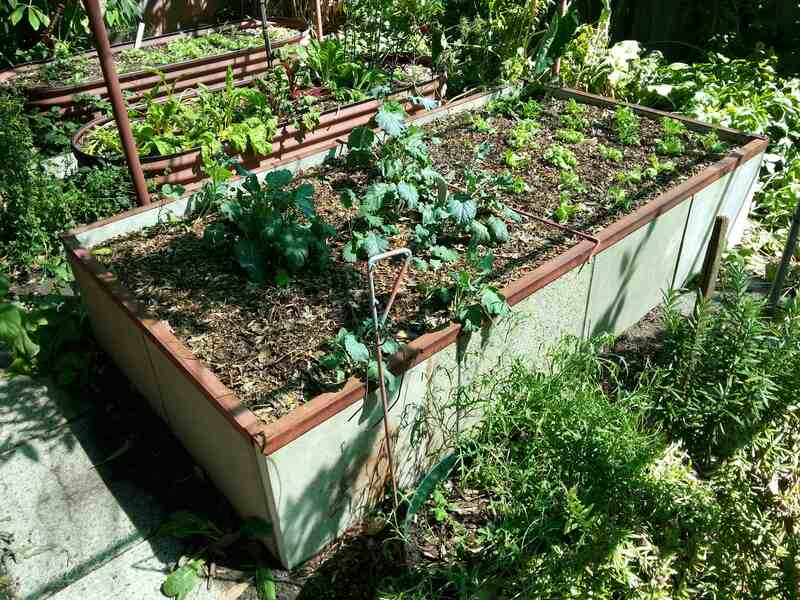 This entry was posted in Event, Food, Kitchen Gardeners, Take Action and tagged DIY gardening, Jetto's Patch, Plants, Protecting fruit, Raised vegetable bed, sustainable food production, Veggies. Bookmark the permalink. Funny all the gorgeous places you don’t even know exist sometimes.